Helpful to a fault, Todd is spread thin doing favors for Princess Carolyn, Mr. Peanutbutter and a visitor with a potential connection to BoJack. Asexuality is something that hasn’t really been addressed in any mainstream form of media up until this point in time. There’s a lot of controversy about what asexuality really is, or how to define it as an orientation. In spite of this, Bojack Horseman is actually doing a great job with handling Todd’s exploration of his sexuality, and with depicting asexuals as normal human beings who aren’t the result of malfunctioning biology or dysfunctional personalities. Again, there’s an issue with congruence of ideas in this episode. The undercurrent of Todd seeking to prioritize his own self-care, while also trying to manage his personal and professional relationships almost comes together. 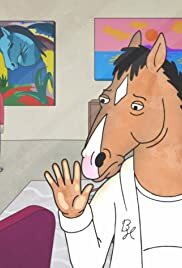 However, between Mr. Peanutbutter’s campaign, Princess Carolyn’s struggle to conceive, and Bojack’s long-lost daughter, there’s just so much happening this season that even in a literal “Todd Episode,” there’s no real room to focus on the inner-life of this character. It seems like because the show has become less and less Bojack-centric that there’s now a serious lack of focus and structure. Bojack Horseman has never really been an ensemble show, and transferring it over to that structural format is an interesting experiment. Despite the efforts to keep the series fresh and original, right now, it doesn’t seem like Bojack Horseman is a show with a host of concurrent and carefully structured plot lines. Instead, we have a great big bunch of loose and hanging threads that are more tangled than tied together.